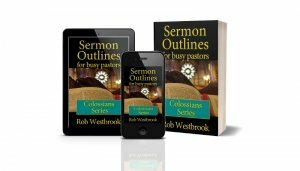 For most preachers and pastors, sermon preparation is probably the one part of our week where we feel we never have enough time. We may set aside a certain day or time to prepare our sermons, but invariably other things pop up. We get an emergency call, we have a sudden family matter or one of those hundreds of other situations, and, before we know it, the time has flown by and Sunday is around the corner. When time is precious, that time needs to be well used. Our selection and use of sermon preparation tools help us use our time better. Good tools are one way to make the most of our time. When I first began preaching, I gathered a concordance and a Bible dictionary and dug in. As I could afford it, I would pick up a commentary or two. Sermon prep became a kitchen table affair (my desk was too small!). I would have books scattered all over the table, lying on top of each other, and yellow legal pads full of unorganized notes. Now all of that helped me prepare, but I spent a lot of time sifting through the material at a snail’s pace. Since that time I’ve gathered more tools that are much more effective in using my preparation time well. All of my tools are now electronic: software and apps. Here’s one of the tools I can no longer do without. My favorite tool is my Logos Software package. I started with the Nelson eBible software, which used Logos underneath. I really liked that software, but a gift from some church members really stepped my collection up quite a bit. I was given the Logos Scholar’s Edition, with a huge selection of resources. I now have a huge collection of commentaries, dictionaries, language tools, and much more available at the click of a mouse. With Logos, once my Scriptures are selected, I can quickly build an entire study in just minutes. All of my commentaries are on tabs that I can switch back and forth between with just a click. I can copy and paste to a text document (I still use WordPerfect) and have my notes right on the screen. The time savings over flipping through pages of 50 books is tremendous. And Logos even has an iPhone and iPad app. They have provided a way to use all the resources you have on your computer on your mobile device, too. Every book I have on my Logos install on my computer, I also have on my iPad. My sermon preparation is no longer tied to my desk! This is a huge feature for the busy pastor. I don’t work for Logos and I have no affiliation with them, but their product is outstanding. For those of us with more to do than time to do it, Logos Software is one of the great, time-saving sermon preparation tools. For more sermon prep tools, click the Resources button in the top menu.